Our team of eight high school interns host and produce the podcast. A new episode is posted every Monday through Thursday throughout August 2010. 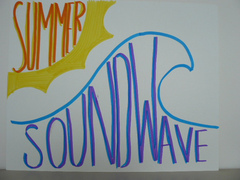 Summer Soundwave is produced by Kellie Blauvelt, Aarti Chandorkar, Devon Dennison, Sarah Dillard, Molly Freed, Zoe Sheinkopf, AJ Solovy, and Bianca Young. Check out our website at www.kuow.org/weekdayhigh for exclusive photos, videos, and intern bios. You can also friend us on Facebook at www.facebook.com/weekdayhigh - or just keep track of our work as it's posted to PRX. The Mixing Board is supported by KUOW Public Radio in Seattle. Nathan Friend and Jenny Asarnow manage the internship program.